The annual Health Fair is a celebration of health and wellness with the community; bringing together numerous health and wellness displays and activities for the entire family. October is National Breast Health Awareness Month! Paint It Pink is a month long fundraising extravaganza held to raise funds to provide local uninsured women with free mammograms, and for the detection and treatment of breast cancer for the people of Lincoln County. 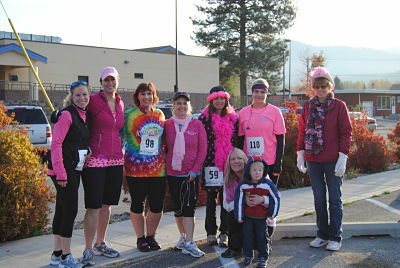 The month is full of fun activities from a 5K Run to the Breast Health Awareness Dessert. Cabinet Peaks Medical Center provides information for those who are interested in quitting the use of tobacco products (smoking and chew). Resources available, as well as general help and hints for quitting are provided. Contact Stacey at 283-7059 for more information. The Diabetes Support Group meets the 2nd Tuesday of each month at 7:00pm at Christ Lutheran Church (200 West Larch St.) in Libby. Cabinet Peaks Nutrition Services and Diabetes Education present a variety of classes for people with diabetes. More information can be obtained by calling Jill at 283-7318. The Stroke Support Group meets the last Wednesday of the month from 12pm-1pm. Stroke survivors and their family members and caregivers are welcome to come and learn more about coping with life after a stroke. More information can be obtained by calling CPMC Rehab at 406-283-7280. This group offers information, practical support, and a warm welcome to family and friends who are caring for a loved one. The group meets every Tuesday at the Libby United Methodist Church from 2:00 - 3:00 pm. For more information, call 293-4522. FREE information, referral, and short term counseling services are available in Libby, Troy, and Eureka for those with questions and concerns about asbestos exposure and how it is effecting individuals and their families. For confidential support in learning to cope with illness, regain control, and recognize and manage chronic stress, call Tanis Hernandez at the CARD clinic at 293-9274, or e-mail her at tanis@libbyasbestos.org. The North Valley Support Group, TBI is for people who have suffered a traumatic brain injury from any cause, as well as for their loved ones. For information on meeting dates and topics, contact Laura Wilde at 295-9753, or Don Walker at 293-6518. The Lincoln County Crisis Solutions provides a 24-hour confidential crisis line and resources about domestic violence and sexual assault. In the Libby area, call 293-3223; outside of the Libby area, call 1-877-493-7139.